Ten years ago this month, the United States invaded and occupied Iraq. This anniversary is an appropriate time to examine, once again, the costs and benefits to U.S. national security from our intervention there. As Americans would quickly find out, President Bush’s declaration of victory was severely premature. Iraq would soon be in the throes of a violent insurgency and, eventually, a full-blown sectarian civil war. 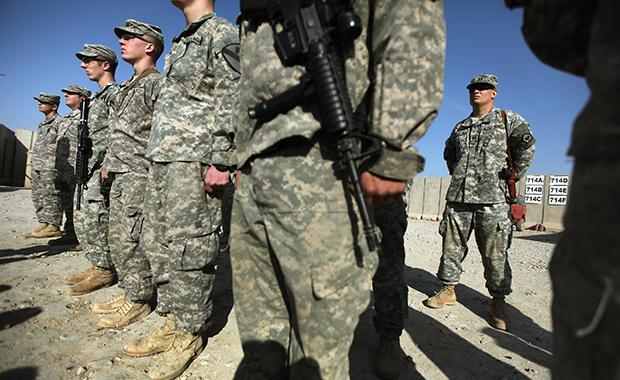 Ten years after that speech, the U.S. military has exited Iraq. 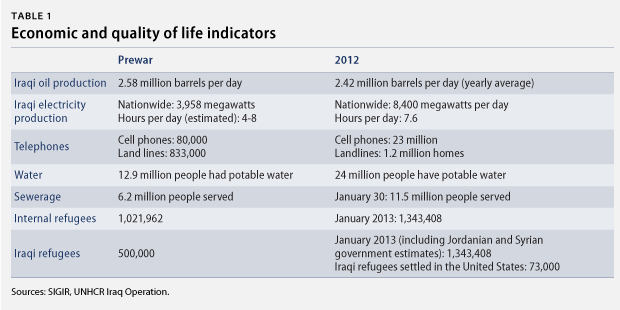 Iraq has made progress but still struggles with insecurity and deep political discord. Though the level of violence has remained down from its 2006–2007 peak—when dozens of bodies could be found on Baghdad’s streets every morning—Iraq still endures a level of violence that in any other country would be considered a crisis. Still, the end of former Iraq President Saddam Hussein’s brutal regime represents a considerable global good, and a nascent democratic Iraqi republic partnered with the United States could potentially yield benefits in the future. But when weighing those possible benefits against the costs of the Iraq intervention, there is simply no conceivable calculus by which Operation Iraqi Freedom can be judged to have been a successful or worthwhile policy. The war was intended to show the extent of America’s power. It succeeded only in showing its limits. Before turning to those tables and charts, however, we would like to make two additional points. 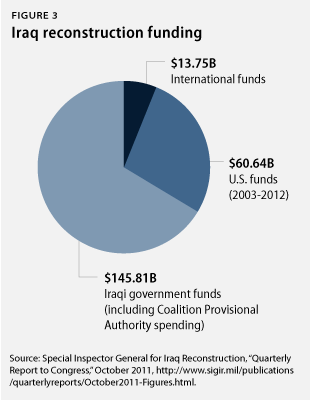 First, it is critical to remember the shifting justifications for the U.S. intervention in Iraq. The Iraq invasion was sold to the American public on the basis of Saddam Hussein’s supposed possession of weapons of mass destruction and his alleged relationship with Al Qaeda. When both claims turned out to be false, the Bush administration justified the intervention on the idea that a democratic Iraq would be an ally in the “war on terror” and an inspiration for democratic reform in the Middle East. These arguments remain, at best, highly questionable. Second, the authors would like to make clear that this analysis of the costs of the Iraq war in no way diminishes the sacrifice, courage, and honor displayed by the U.S. military in Iraq. Americans troops have served and died in Iraq at the behest of the American people and two of their commanders-in-chief. 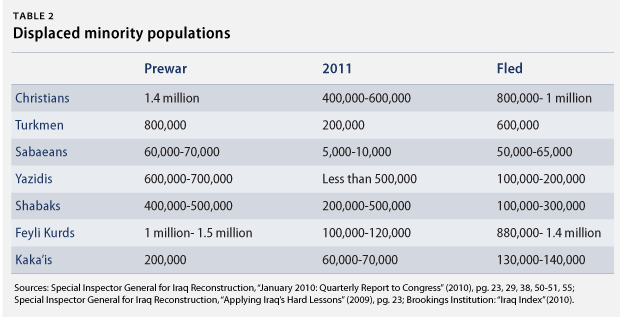 This is why it is important to draw the correct lessons from our nation’s invasion of Iraq. In order to do that, its costs must be examined honestly and rigorously. 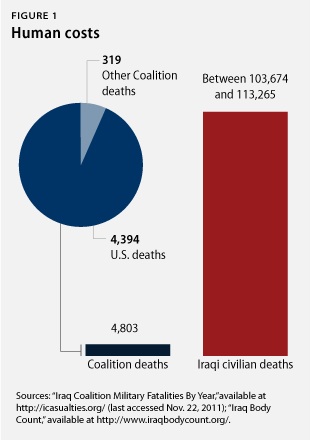 The numbers for total deaths and Iraqi civilian deaths represent the lower end of estimated deaths caused by the Iraq war. We would like to acknowledge that other studies, such as those carried out by the Johns Hopkins Bloomberg School of Public Health and the Iraq Family Health Survey, estimate much higher civilian deaths as a result of the war. The foregoing costs could conceivably be justified if the Iraq intervention had improved the United States’ strategic position in the Middle East. But this is clearly not the case. The Iraq war has strengthened anti-U.S. elements and made the position of the United States and its allies more precarious. Created terrorist training ground The years of U.S. occupation in Iraq created not only a rallying call for violent Islamic extremists but also an environment for them to develop, test, and perfect various tactics and techniques. These tactics and techniques are now shared, both in person and via the Internet, with extremists all over the region and the world, including those fighting U.S. troops in Afghanistan. Iraq continues to struggle with the problem of terrorism, and ranked first in the 2012 Global Terrorism Index published by the Institute for Economics and Peace. Loss of international standing. While abuses are perhaps inevitable in any military occupation, the images and stories broadcast from Iraq into the region and around the world have done lasting damage to the United States’ reputation as a supporter of international order and human rights. Gen. David Petraeus has said that the damage done to the United States’ image by Abu Ghraib is permanent, calling it a “nonbiodegradable” event. Diverted resources and attention from Afghanistan. Rather than stay and finish the job in Afghanistan as promised, the Bush administration turned its focus to Iraq beginning in 2002, in preparation for the 2003 invasion. Special Forces specializing in regional languages were diverted from Afghanistan to Iraq, and Predator drones were sent to support the war in Iraq instead of the hunt for Al Qaeda in Afghanistan and Pakistan. “Iraq’s instability has become a convenient scarecrow neighboring regimes can use to delay political reform by asserting that democratization inevitably leads to insecurity.” Iraqi Prime Minister Nouri al-Maliki has shown little interest in strengthening the institutions of Iraq democracy, but rather focused on consolidating his own power. Rather than supporting democratic forces in neighboring Syria, Iraqi Prime Minister Nouri al-Maliki has repeatedly voiced support for Syrian dictator Bashar al-Assad. Fueled sectarianism in region. The invasion of Iraq replaced a prominent Sunni Arab State with one largely controlled by Iraq’s Arab Shia majority. While the end of the oppression of Iraq’s Shia majority is a positive thing, this shift has exacerbated regional tensions between Shia and Sunni, including in Saudi Arabia, Yemen, Lebanon, and Bahrain (where the U.S. Fifth Fleet is based). Lingering disputes in Iraq between Sunni and Shia Arabs, Kurds, and Turkmen also continue to invite exploitation by both state and non-state actors. Matthew Duss is a Policy Analyst and Director of Middle East Progress, and Peter Juul is a Policy Analyst at the Center for American Progress.